The board, teachers, learners and parents of Kuisebmond Primary School welcomed the donation of trophies and medals to the tune of N$3000.00 at their annual prize giving ceremony held on Thursday, 10th October 2013 at the Kuisebmond Community Hall .The ceremony which attracted various local sponsors, the Inspector of Education, Ms. Monica Gaoses and the Junior Major of Walvis bay, Mr. Feris placed a smile on most learners and parents as around 80 achievers were rewarded for their hard work that evening. 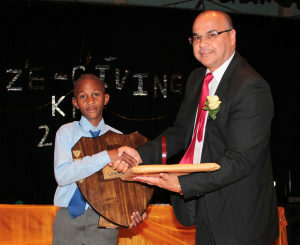 In his address on behalf of the CEO, Mr. Norman McClune said that many of you will have strived to do your best in order to be a part of this ceremony and I believe that represents a true spirit from Kuisebmond Primary school. Although we all know that taking part is a key element in team sports, school events and life in general, winning is what makes us push ourselves and achieve our full potential”. He encouraged the ones that did not achieve anything by saying that” please remember that there is a next time and make sure to be part of next year’s group of achievers. If you make mistakes along the way, that is fine, but do ask for help. By the way, one learns from one’s mistakes. One never fails by making mistakes; one only fails by giving up. I have no doubt in my mind that you are well on your way to becoming very successful adults one day. He also revealed that the Board of Directors of Erongo RED has recently resolved to give preference to the learners within Erongo region when giving bursaries. Therefore, we are committed to help and assist ambitious young people like you to explore your full potential, McClune said. Mr. McClune expressed his gratitude towards the organizers of the event, the parents, the teachers and everyone who made the evening a success. Continue on supporting and motivating the future generation of tomorrow”. McClune concluded. During her speech, Kuisebmond primary School’s Principal, Mrs Shannon Fisher thanked each any every sponsor from the bottom their hearts. She said if it wasn’t for them, this event would not have been possible and the entire Kuisebmond Primary School Board, management, Learners and parents are very thankful the generous contributions”.